It's amazing, Microsoft officially made an announcements about their first mobile cloud base Microsoft Office application. Microsoft Office is now available for iPad. 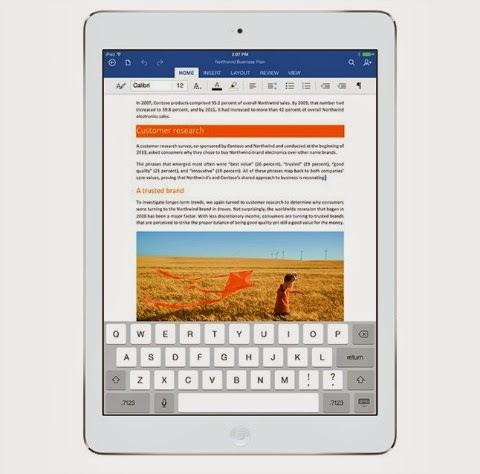 Microsoft Word, Excel and PowerPoint for iPad can now download directly from the App Store. These three apps can download for free and use for viewing Word documents, Excel data sheet and PowerPoint presentation. But if you like to edit or create new Microsoft Office file in your ipad, you need to have Office 365 subscription. So if still interested to try the Microsoft Office in your tablet, just click here. Comments or suggestions about "Microsoft Office for Apple iPad is now available to download" is important to us, you may share it by using the comment box below.